Cataracts are the most common cause of curable blindness. However, in poor, remote and rural communities, due to lack of awareness and eye care facilities, the disease is often not caught in time and partial sightedness and blindness result. A blind person in poor communities is severely handicapped and the condition is a heavy toll on the individual and the family. In the years of engagement in the outreach cataract program, it is clearly evident that more than just the restoration of sight is achieved. Individuals who have been driven to destitution regain their dignity. Some rejoin the work force. Families that fall apart due to a visually impaired parent, especially a single mother of growing children, reunite and enjoy a new lease of life together. 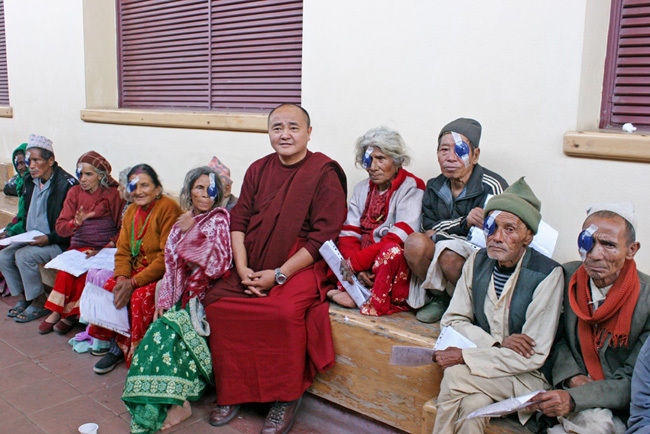 The Third Jamgon Kongtrul Rinpoche shared the humanitarian ideals of the eminent ophthalmologist, Dr. Sanduk Ruit, to combat treatable blindness in poor, remote and rural areas of India and Nepal. Inspired by his wish, Jamgon Kongtrul Labrang began annual outreach cataract progammes in 1993, in technical collaboration with Nepal’s Tilganga Eye Centre under Dr. Sanduk Ruit. 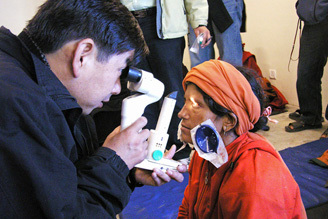 By the end of 2011, more than 100,200 patients had been screened in various parts of Nepal and the remote and rural areas of Kalimpong District, and more than 10,500 patients enjoyed treatment of cataract surgeries and received intra-ocular implants.